GPS Jammer is designed for area and assets protection against satellite navigated threats like GPS guided missiles. The SCL-APSNT can also be used against low flying UAVs to prevent reconnaissance of important place. 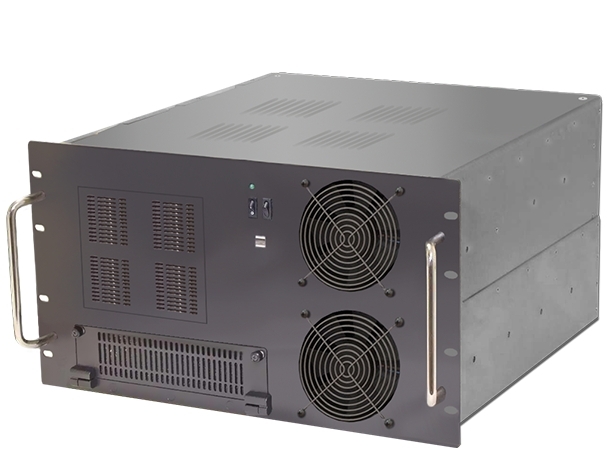 GPS jammer can be effectively used in combat situations for eliminating satellite navigated guided weapon systems, missiles and ground/airborne threats It is designed to operate on all satellite navigation system available today or in the near future including GPS, GPS II, GALILEO and GLONASS at different power levels. It is upgradable to operate on COMPASS. (SCL-APSNT) provides protection ranges from 30 Km to 150 Km depending on the power output of the jammer and the envisaged region of coverage. The (SCL-APSNT) is capable of jamming GPS signals of both the civilian and military use and provides protection to well-defined geographical area from sky and ground threats without effecting normal navigation services outside the area. The SCL-APSNT covers the GPS bands L1 (Codes P (Y), C/A, L1C, M-Code) and L2 (Codes P (Y), C/A, L1C, M-code). GPS finds major use in most equipment and systems to provide location information instantly both in civilian and military applications. These devices use the signal received from a minimum three GPS navigational satellites or more to calculate the location information. The use of GPS Systems helps terrorists to navigate both on land in mountains, jungles or desert terrain thereby providing them with a high degree of mobility and action capability. Availability of UAVs or drones with GPS capability also provides capability to terrorists to have surveillance of potential target sites for reconnaissance. This provides them the capability to cause death of both civilians and security forces as well as destruction of property and infrastructure giving them high visibility for their cause. There is extensive use of GPS in military equipment and systems both on man-pack and vehicular basis enable forces to move accurately during operations both during day and night. Shoghi has a variety of GPS jammers which can be used for specific applications. The Shoghi GPS L1 and L2 Denial System is a versatile jammer which has the capability to work on either of the two bands used in the GPS sytem. The L1 Band working at 1.023Mchips/sec at 1.575 GHz is most heavily used band by commercial GPS devices which is covered by the jammer. It also works In the L2 band at 10.23Mchips/sec at the frequency of 1227 GHz which are used by military forces. This versatile GPS denial system has a fully programmable low power unit which can be programmed for almost any jamming waveform needed and then through microwave frequency converters the jammer can be configured to operate in any or both frequency bands. 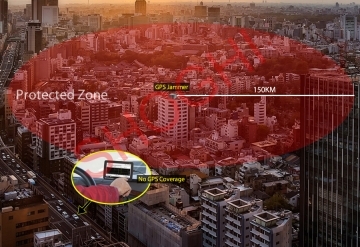 The GPS denial system has variety of antennas for catering to the type of threats. The jammer power radiation pattern can be kept Omni-directional, sectoral or directive depending upon the value of the protected asset and the threat perception. The jamming in L1 band can provide security against use of commercial GPS used by terrorists for location reconnaissance for protection of operational HQs, government buildings and sensitive installations and prevent use of spy drones or small low flying UAVs from carrying out target reconnaissance or delivery of IEDs by air. The GPS jamming of L2 band at the crucial stages of location reconnaissance and target selection, launching of weapon carriers to the target areas, their positioning, flight trajectory correction of guided missiles will result in the reduction of missile and artillery strike efficiency significantly and reduce the impact of these force multipliers. The second type of GPS jammer is Area Protection System against Satellite Navigated Hostile Threats which is a system designed to protect specific locations against missiles guided by GPS. It will effectively protect a well defined area from ground and sky threats while it will not, in any way, affect normal operation of navigation services outside this area. It is designed to operate for all Satellite Navigation Systems available today or in the near future, including GPS, GPS III, GALILEO and GLONASS. It is upgradable to operate for COMPASS. This is very useful to protect important locations like power generation facilities, national government or military headquarters or other critical sites from attack using GPS guided weapon like missiles or bombs. The system covers the standard GPS bands L1 (codes P(Y), C/A, L1C, M-code) and L2 (codes P(Y), C/A, L1C, M-code) while versatile options allow the system to be configured for GPS III, GALILEO and GLONASS. It can provide cover for military signals from 10km to 150km and for civilian signals it varies between 30km to 350km. The range depends on power amplifier and Antennas used and the total number of bands simultaneously active at a time. Turnkey solutions can be suitably designed based on type of threat envisaged and extent of protection required in terms of range. It also depends on the type of terrain and natural obstacles in the area. 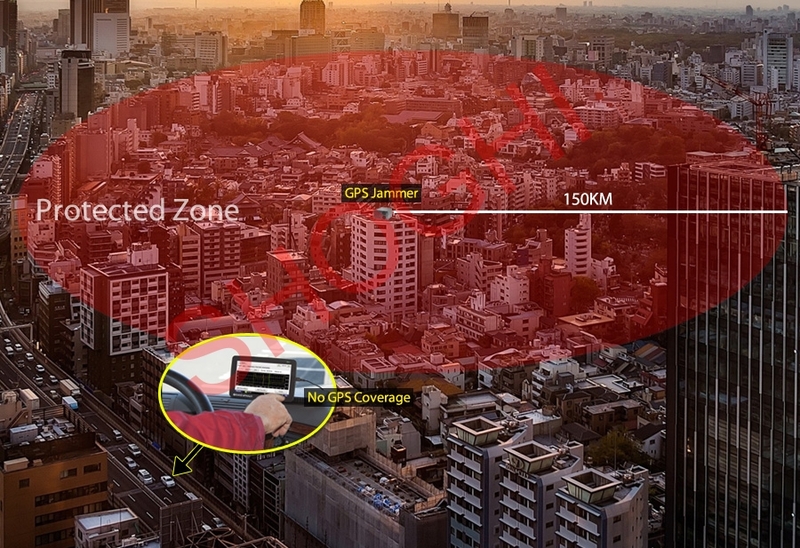 Shoghi has a very wide range of GPS jammers which can provide the required type of protection for both static locations as well as mobile columns. The type of jammers and their utilization can be customized depending on customer requirements and deployment envisaged. Shoghi also prides in the intimate maintenance support provided by it during warranty and the entire equipment life cycle for the complete satisfaction of its esteemed customers.